Homes is a memoir of Abu Bakr al Rabeeah's childhood in Iraq and Syria, and how his family came to Canada as refugees. 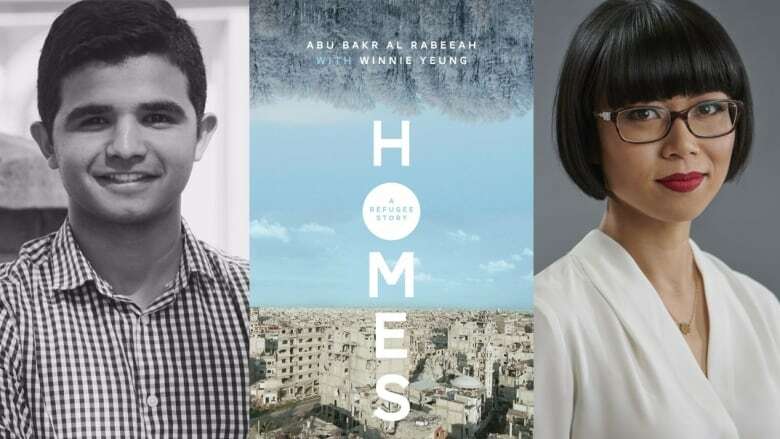 Homes by Abu Bakr al Rabeeah & Winnie Yeung is a Canada Reads 2019 contender. It was defended by musician Chuck Comeau. Homes is a memoir of Abu Bakr al Rabeeah's childhood in Iraq and Syria. Just before civil war broke out, the al Rabeeah family left Iraq for safety in Homs, Syria. al Rabeeah was 10 years old when the violence began in his new home. He remembers attacks on his mosque and school, car bombings and firebombs. Now a high school student in Edmonton, al Rabeeah shared his story with writer Winnie Yeung in hopes it will bring greater understanding of Syria. You can read an excerpt from Homes below. Every Friday on the way home from the noon prayer service, Salat al Jum'ah, Father stopped to buy fresh fruit from the street vendors. Our mosque was barely a block from our apartment and the walk home was always a loud, lively time, with neighbours and friends catching up at the end of the week. On the day of Father's birthday, April 18, he bought fruit for the family as usual but rather than lingering to chat, he hurried home. All morning, the fighter jets had screamed by. In the weeks before, every mosque in our neighbourhood, Akrama, had been attacked. Father texted me to go straight home after the service. I always looked forward to Salat al Jum'ah. The comfort of belonging, Father in his white, ankle-length thawb tunic, the soothing prayers of peace murmured shoulder to shoulder with friends. I always went with my buddies or cousins, and on this particular afternoon, my neighbour and best friend, Amro, and I laughed as we joined the sea of people spilling out onto the packed street. "The sheikh, he lives in the mosque. W'Allah! Trust me, I know," I boasted as we approached our usual meeting spot outside. "Ugh, no! You think you know everything, Bakr, but bet you he doesn't," insisted Amro. "W'Allah! I swear! Fine, loser buys sodas!" Our friend Ali sauntered up to us, hand out-stretched, and I clasped it firmly. "Jum'ah mubarak. Blessed Friday, my friend. Hey, settle this bet fo —"
I was just pulling my hand away from Ali's when the blast hit us. Time expanded and stretched; I saw and felt everything in a disjointed way that seemed too slow to be real. As I fell back, I heard the low whoooosh of the taxi full of explosives shooting straight up into the clear blue sky, blocking out the sunlight. In that moment, all I could think was, "Where did the sun go?" The car came crashing down, twice as fast. We were thrown to the ground and showered with gravel and sand. In action movies, the hero always has ringing ears after an explosion and all sound is muffled. That wasn't true for me. The world was muffled for only a split second and then screams filled my ears and Father's voice pierced through the mayhem. "Abu Bakr! Abu Bakr! Abu Bakr!" That's the sound I still hear when I think about my first car bomb: Father screaming my name. That's the sound I still hear when I think about my first car bomb: Father screaming my name. I dragged myself up and spun towards his shouts. Father was weaving through the desperate crowds and when he reached me, he grabbed me by the shoulders and turned me this way and that, like a man inspecting a melon at the souk. Satisfied that I was okay, he steered me home. Moments before, the street in front of our apartment had been filled with people laughing and chatting. Now there was only chaos. Feet running, voices shouting, arms gripping wounds, cellphones frantically trying to document the destruction. The flaming shell of the taxi was only steps from our apartment building. Terrified of what we might find, we rushed through the garden and into our suite. The living room and kitchen were abandoned with lunch half laid-out on the table. Where was everyone? We heard noises coming from my parents' bedroom. The rest of my family was safe, crammed into the small room. My older brother, Naser, told us that when the bomb exploded, he'd been stretched out on the couch watching TV. Mother and my sister Abeer were cooking in the kitchen. Aiesha and Maryam were in their bedroom, Aiesha texting a friend and Maryam finishing her prayers. Thank God. Maryam was kneeling far from the window, which shattered from the force of the explosion. At the sound of the blast, they all took shelter in my parents' bedroom where Asmaa had been with the two youngest, Abrar and Alush, helping them get ready for the day. Alush was jumping around with a cotton swab still hanging out of his ear, shouting, "What happened? I wanna see!" Telling everyone else to stay put, Father led Naser and me out to the living room. Our shoes crunched on glass shards as we inched towards the patio doors to see what carnage lay just beyond our garden wall. Out on the street, ruined flesh. A torso without a head. And blood, trickling streams of it. Puddles soaking into the pavement. All I could do was stare as Father and Naser rushed past me to help. I pressed my temples to try to stop the ringing in my ears. The smoke and dust burned my lungs. Minutes later, Father returned, half-dragging a young man with blood spurting from his neck. Father shouted, and out of nowhere, a white scarf appeared. My mother and sisters helped the young man into the bathroom where they bound his neck as best they could. And as I just stood there watching, the stranger stared blankly at himself in the bathroom mirror. The white scarf bloomed red. My sisters fussed around him while my mother adjusted the scarf again to slow the flow of blood. Finally, he managed a smile and mumbled his gratitude. "Bakr! Come!" I snapped to at the sound of my father's voice. Father and I helped the stranger back out onto the street and into one of the many cars waiting to help transport the wounded to the hospital. I pressed my temples to try to stop the ringing in my ears. The smoke and dust burned my lungs. Still dazed, I wandered back into our garden while Naser and Father remained out on the street. I nearly stepped on one of our chickens — I hadn't noticed them in all the confusion but they were all there, standing stock-still. It was like someone had hit pause when the car bomb went off. Their little black eyes blinked every so often, but their bodies were rigid with terror. The blue and green budgies, surprisingly, were chirping contentedly in their cages. The old stone wall in front of our garden was still intact, even though the section next to ours now had a gaping hole in it. My father stood there examining the crumbling wall. Months later, that same wall that had withstood a bomb blast collapsed during a windstorm. As I refilled the water for my birds, I heard Father and Naser checking on our neighbours. Mother and my sisters were busy cleaning up all the shattered glass inside. The reporters and camera crews descended, hastily assigning blame on some rebel group or other, and behind them, the street-sweepers and the clean-up crews hurried to wash away any evidence of dissent. Eventually, the streets would be silent as everyone else hid in their homes. The chaos of the day was seeping away slowly and all I wanted to do was get back to my normal. It was Friday evening. Time to go to my cousins'. After telling Mother where I was headed, I scurried through the back alleys to avoid the military checkpoints that dotted my neighbourhood. It wasn't safe to be in the main streets. After an attack, the place was always crawling with Assad's army or, worse yet, his shabiha goons. Document checks for our safety, supposedly. People were randomly questioned or even detained for hours, sometimes days. When the grenades exploded or machine guns rattled, you never knew if the attack was coming from the government or the anti-government militias that fought to control the streets of Homs. It was a continual call and answer of mortars, guns, Grad rockets, and missiles. When I arrived at my Uncle Mohammed's apartment, I felt like myself again. I'm glad I didn't stay home that night. I'm glad I spent the night playing PlayStation with my rowdy cousins instead. On the streets outside my home, the dogs would be the final arrivals to the bloody aftermath. In the quiet of the night, strays descended onto the streets, yipping, howling, feeding. As I strolled home the next morning, I met Amro and a few other buddies from our building. After three years of living in civil war, we had become strangely numb to the random violence that bubbled up around us. "Hey Bakr, your family good? Where'd you go last night?" Amro's voice bounced off the walls and buildings of the quiet street. "Yeah, everyone's fine. I was at Yousef's. You know, Friday night." I shrugged. "FIFA13 again? Man! Tomorrow night — my place. Rematch from Wednesday's game." "Sure, sure." We smiled at each other and he sucked in a quick breath through his teeth. Leaning against the garden wall, we stared at the gruesome mess that remained. There, beneath a tree, just a month after my thirteenth birthday, I buried a man's jawbone. The corpses had been carted off but flecks of flesh and bone still stuck to the sidewalk and the walls where we hung out. The stench was overwhelming: a putrid smell that hit the back of the throat. I couldn't breathe in without tasting it. We all had our noses tucked into our collars. Sighing, I went in search of some garbage bags. Someone else retrieved a mop and bucket from home and we mopped and poured bucket after bucket of water into the street. Of course, Amro splashed water about and made stupid jokes. We elbowed each other in the ribs while we scrubbed at the bloodstains. The street slowly filled with others joining in on the effort. After a few hours, it almost seemed normal again, even though the air felt heavy with the spirits of the dead. By the time we finished, it was late afternoon. I washed up and joined my family in the living room where they were eating and chatting. As I plopped down onto a couch, Mother cocked her head to one side and stared hard out the window. "What is that?" she asked, pointing at something snagged on the roof of the chicken coop. Of course, Father sent me to investigate, and as I hoisted myself up on the roof, I came face-to-face with a man's jawbone. In the last year, there had been many public service announcements instructing people to bring heads or limbs that were found after attacks to the hospital or police station . . . but a jaw? I grabbed a white plastic grocery bag from the kitchen then climbed back onto the chicken coop. I plucked the jaw from the shingles and stared at it. The skin was clean-shaven and smooth. The teeth were perfectly straight. The only thing that seemed right was to give it a dignified burial. Clutching the garbage bag, I headed towards the park down the street. There, beneath a tree, just a month after my thirteenth birthday, I buried a man's jawbone. From Homes by Abu Bakr al Rabeeah & Winnie Yeung ©2018. Published by Freehand Books.